run articles and editorials about the 1794 Presbyterian, Fulton and Fulton Mechanick's Cemetery since the turn of the 20th century. 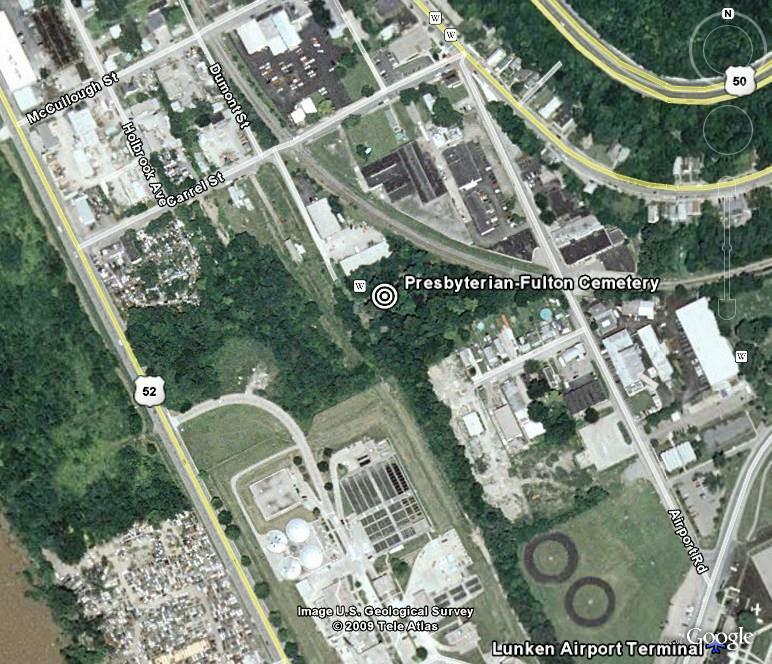 Many Cincinnatians are familiar with the nearby Pioneer (Baptist) Cemetery, close to the Lunken Airport Terminal building on Wilmer Avenue. Pioneer was restored and is maintained by the city of Cincinnati and is a fitting tribute to the areas earliest settlers. Presbyterian, Fulton and Fulton Mechanick's Cemetery (PFC), only 500 feet from Pioneer Cemetery, sits off the beaten path at the end of industrial Dumont Street. Despite its 1794 founding, ownership was not clarified until the Presbytery of Cincinnati obtained quiet title to the Presbyterian portion in 1970. They were also charged by the court with "use and care" of the adjacent Fulton and Fulton Mechanick's Cemeteries, although they do not own the Fultons. Ownership of the Fultons apparently resides with the heirs of the original owners, on a plot-by-plot basis. Click here for an aerial photo! PFC stood mostly forgotten, neglected and vandalized from about 1870. Near the Ohio River, it flooded frequently. The adjacent Pennsylvania Railroad tracks seem to have brought hoboes and drifters; there is some evidence of their use of the cemetery even today. Maintenance was the occasional church group or Boy Scout troop cleaning up the trash, usually in response to a newspaper article or editorial. But there was no long-term commitment to preservation or restoration. When our volunteers started in the fall of 1999, PFC was literally a jungle of honeysuckle and weeds. It was filled with trash, tires and fallen trees. Fragmented, vandalized headstones littered the landscape - we're starting to restore them now that we can see them. At least five Revolutionary War veterans rest here, including the first to receive a Purple Heart from George Washington. His headstone has not been found, but may lay among the fragments. Individuals, groups and businesses can all participate and learn a little history. We can assign you or your group a “plot” to manage at your convenience. Please call or email and we’ll make arrangements. We usually do group work on Sunday but you can work on your own plot any time you wish. We concentrate on weed control. If you have a sprayer and chemicals such as Roundup (some of which you wouldn't mind donating), please bring them. Wheelbarrows and rakes are helpful. We'd like to "borrow" a commercial tree chipper, chain saws and people to operate them. We have fallen trees to cut and lots of smaller logs and branches to be chipped. You may take any of the cut or fallen wood as firewood. If you cannot participate, perhaps you know someone who could; please pass this along. To help us defray costs (contributions may be tax deductible), please contact me. Tours of PFC are gladly provided. Click here for further volunteer information and directions.